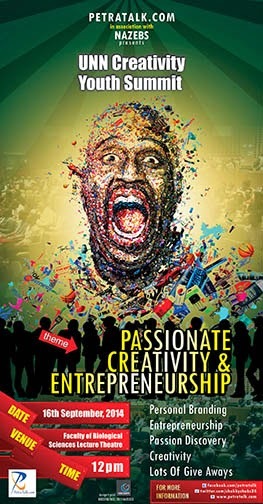 The UNN Creativity Youth Summit 2014, to be held at Nigeria’s premier University, is a one-day conference and will have participants and facilitators from within Nigeria. It will be conceived as a forum where creativity and intellect commingle. The yearning for difference is the mother of ambition and achievement. Young creative people as the future of Nigeria will be motivated by a panel of fulfilled creative minds. NOTE: Registration is free but mandatory for participants. Seats have already been taken by registered participants. The available seats are limited. Registration would soon end.